It was less than a week ago I woke up to a flurry in the Apex folder of my RSS feed and I knew something Apex related had been announced! After reading Dimitri's comments regarding Apex 4.0's Tree View vs Component View, I had to learn more about this new view as it immediately made me think of all the Forms programmers out there learning Apex. In addition to Oracle's Apex page dedicated to Forms developers, their Oracle Development Tools Statement of Direction states that instead of creating migration tools, they wish to create environments that expose similar concepts as Forms and Reports, giving to Forms and Reports developers the opportunity to become productive in a new, but familiar environment. So as soon as I saw Apex 4.0's tree view, it made me think of the Oracle Forms object navigator. Compared with the Forms object navigator, today's technology provides the Apex team with the ability to create a more dynamic environment. The browser environment, however, does also bring it's drawbacks. Expanding and collapsing in Forms, while minor, did create time saving opportunities. As Dimitri noted, the tree view does also limit the information you can see at once, such as conditions. I can foresee having to locate these via tool-tips may become frustrating. I do agree with Dimitri in his comment that the tree view does provide an insight to the overall page process. This can assist Forms developers and those new to the Apex environment, but let's not forget the Page Events view. Previous to Apex 4.0, this was one click away - however now it's three clicks and two pages away. This Page Utilities option offers some new layouts that may turn out to be useful, plus a location to store links for some existing features. The grid edit of pages is a nice way to modify those attributes, and navigate to the relevant pages - but does take time to navigate to. The page attributes also provides a potentially useful summary detailing counts of various page components. There are also subtle changes around the place, one I do like is the runtime Developer Toolbar is now "frozen" to screen like a semi-transparent frame. After a quick browse through the Application Migrations section, there are no obvious changes to the Forms to Apex conversion utility - including fixing some issues I uncovered while writing my presentation. In an overall perspective, I think more screen real estate is unnecessarily used - particularly by the main application page. For those of us using laptops, screen height can be an issue. That being said, I do look forward to seeing how useful the various new dashboards can be. As for the tree view, I'm undecided where I may spend most of my time. I think while it does illustrate the page processing very well, those familiar with Apex intricacies may stick with the existing screen showing more information is shown without interaction, and where double clicking is not necessary. This is all without mentioning the extra coding grunt being provided out of the box. Keep a close eye on the Apex blogs for more information on these. Not surprisingly, the world still ticks - even when I'm on holidays. I've finally caught up with my RSS feeds - the work related ones anyway - and I've compiled a brief list of those that caught my eye in particular. When trying to catch up on three weeks of feeds, the best reads tend to stand out. Comparing Oracle & MySQL - this may become more relevant as time goes on, and will certainly be useful every time my MySQL friend asks me Oracle questions. Oracle XE 11g - while I'm not waiting for it, that would be a useful release, particularly for those who want to tinker and learn from home. asktom.oracle.com/tkyte - I spotted the loss not long after Tom jumped domains, so it's good to see all his reference scripts made available again. Multibyte characters - I encountered this issue recently, but not because I was coding for another language. I was importing data files that contained characters that I wasn't expecting, so I had to consider width as Alex described even though I was substringing a particular length. Unwrapping PL/SQL - It's amazing how many people are curious about this. Apex & Web 2.0 - There are some great demo applications linked through here. And as I write this my replacement laptop power adapter arrived - let's hope it works. No more excuses for me! Recently in the blogosphere - not just Oracle related blogs – I’ve noticed an increasing number of book reviews. Normally I’ve found these reviews are by authorities as part of the regular marketing campaign. As with other industries, new forms of marketing evolve – in this case one that facilitates professionals in the field an opportunity to provide critique on new texts. 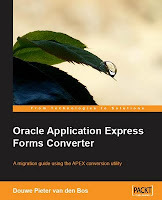 I was recently provided the opportunity to review a book discussing how to use Oracle’s tool to convert Forms applications to Application Express: Oracle Application Express Forms Converter by Douwe Pieter van den Bos. This book, published by Packt Publishing, is the first of its kind on this subject matter, and you may have seen the cover if you regularly visit Oracle based blogs – particular specialising in Apex. This opportunity is in part due to the fact I’m presenting on this very topic at this year’s AUSOUG conference series. It’s a tough topic. Oracle Forms has a large presence throughout the world, but it’s ageing. Support is consistently being extended, however this support is predominantly there to keep it stable. Oracle is suggesting to customers to move towards new environments such as ADF and Application Express. Converters between technologies have been around for a long time, and Oracle offers an Oracle Forms to Application Express conversion tool. There are many facets to a conversion between technologies, and the industry is typically aware that a tool will rarely be a silver bullet. There are such fundamental differences between technologies and human interaction and guidance is always required. Accompanying documentation with the tool is regrettably lacking. While it describes the conversion process using the product, it doesn’t go into detail about what else needs to be done - so the situation is ripe for a book offering. When reading books, fictional, non-fictional – and the subset of that being technical manuals, I always seem to be lucky in selecting the good ones. I rarely find myself reading a bad book, which is lucky since like movies, I don’t want to stop regardless of how bad it is – curiosity killed that cat. Unfortunately, I feel compelled to give this book a less than enthusiastic review. To the author’s credit, it’s partially due to what I feel is not only a disappointing tool, but a difficult concept to actualise as software. The book starts very well, dictating exactly what the book offers and provides no disillusion to the reader about what the conversion itself offers. David Peake’s foreword offers insight into how the tool came to be, and the author’s preface re-iterates how much work will be required to convert the application between the two disparate technologies. Each chapter is just like the copybook for presenters. Say what you're going to say, say it, say what you've said. I like this, personally it reconfirms what you've learnt, and it makes it a little easier to find things in future. It reads very much like a blog or OTN article, which works well for me. I remember some texts from University being very dry as it just stated facts, where if the book almost forms a conversation between the author and reader, it makes concepts easier to learn and your attention is kept. The book stated in the preface "because this book is written for developers and analysts who know both Forms and Apex." I think this is the perfect target audience as for this subject best value would be obtained by directing attention to developers who have a decent understanding of both products. Suggest to readers whose knowledge of Application Express is low to read an Application Express specific book such as Pro Oracle Application Express by John Scott and Scott Spendolini (so many Scotts!). As a reader of this book I really want to know the ins and outs of conversion – not just the tool itself but all considerations that need to be made since the tool will only handle a small percentage of the conversion. For this topic I feel a fair and safe assumption would be, for example, a decent understanding of how to create an LOV in Apex. The author, however, spent time discussing some of these Application Express basics which detracted from the main topic of conversion. During my presentation I stated the assumption that the audience knew how to enhance Apex – this allowed me to concentrate on the issues that would be faced during the conversion and what components needed to be targeted. On a positive note, it does make a presumption you've got decent knowledge about the sample application they're converting, which is fine if again you consider that you want to understand the process – not a description of the sample application which is really just a catalyst. There is always a concern that the sample application is tweaked and diluted to show the strengths of the tool. In a basic sample application I created during my experimentation, I found many more issues that needed to be considered. After a strong start where we heard how difficult a conversion process can be, I felt the chapters were finishing too quickly. For instance Chapter 5 talked about “Getting your Logic Right” - where you can edit the queries used. I found this to be the buggiest part of the process and no mention of these problems were made. At 10 pages, Chapter 6 on the actual conversion was thin. The author talked about how we can “edit the most important parts of the application”, yet he just seemed to describe aesthetics – even then to surface level detail. I found this process to be the source of the most frustrating elements of the conversion - item types weren’t carried across; ordering of items was indeterminate; and usage of UI defaults were necessary but not mentioned in the book. For a large application, the list of pages to be generated would create more confusion for the developer than to have just created all pages from scratch. My sample application caused generation errors, but why didn’t the author didn’t cover this possibility? Chapter 7 is when we see the author question our knowledge of Apex, presuming we don’t know its standard features. The LOV example I found demonstrated the author deviated from the topic of conversion to that of educating about Apex, which is a shame because it was a good time to highlight the fact we were missing components from the conversion; describe how to properly address it; how long it may take to do so; and how we could use annotations to continue effective management of the conversion – probably the most useful feature of the conversion tool. I think sometimes the author gets a little off topic, even though he promised not to earlier on when stating targeted audience. For example in his final chapter he talks about security and pulling multiple applications together, too far removed from the conversion process for my liking. Documentation on Application Express is already pretty thin, especially when comparing against the comprehensive documentation found for the database. Don’t expect this to be the manual for converting your Oracle Forms applications to Application Express - it’s a wonderful starting point to understanding how to use the tool, but not great at mitigating likely issues of your conversion. My recent leave from work has been most enjoyable, and to share the wonderful news my partner and I eloped to Fiji to get married! It was just the two of us, but family & friends are happy with the news - some indicating they had their suspicions. I thought my boss, Penny, sprung us in the taxi rank in Melbourne. She either said nothing or didn't spot Tracey's dress past our carefully placed luggage. I shall find out tomorrow. In terms of the Australian Oracle User Group Conference, right now represents the time between the successful Perth leg and the Melbourne finish. For some, the series is over, one city is enough. For others, it's a quick re-jig of the presentation before whisking off to another state or 3. For me, as exhausting as it was, I'm looking forward to viewing those great presentations I just couldn't fit in between all the others I wanted to see. For us at Sage, we had a great time and our presentations went well. Penny's involvement ODTUG stream was a success. Ray & Eddie assisted putting together a very organised look at putting Ajax into Oracle Application Express. I popped into Penny's best practices presentation while I was gearing up for mine and I saw plenty of heads nodding and what I'm sure were people thinking "I must go back and do that when I get back to work!" Multiple award winning Chris Muir kept churning out excellent information, and quite happily accepted the challenge to extend his presentation time when an opening appeared. All this while Branka & Kate held the fort at the Sage booth, keeping people fed (with chocolate) and keyboards clean with our little trinkets. My presentation on converting Oracle Forms to Oracle Application Express went well, although 90 minutes sure does seem to go quickly when there is so much to be said. Howard Ong - Demonstrated a great introduction to Oracle Designer's replacement - the verbose Oracle SQL Developer Data Modeler. Despite some early bugs on Oracle's part, it shows much promise and we all feel it will come through quickly just like SQL Developer did. Lynn Munsinger - showed Oracle Forms programmers like me why ADF will be a fairly simple transition. I was quite impressed with the comparisons she made, in particular the analogy of comparing a washing machine to a dishwasher when talking about conversions. It was great to hear an Oracle product manager confirm some of the sentiments of my own presentation. Connor McDonald - this man once again outdid himself and walked away with the best (OTDUG stream) award for his SQL-ectric look at SQL, Analytics and the Model clause. I think the crowd thinned a little bit the deeper he got into it, but it remained entertaining throughout. Gabriel Ilarda - after a few years of jeering, he found himself on stage talking about Oracle Data Warehouse builder. Despite Murphy's Law jumping all over his live demo, the message came across well. Tim Armitage - we jokingly lamented on those who didn't come to hear about Oracle 11gR2's best feature - Edition Based Redefinition, but they were probably enjoying Tim Hall talk about PL/SQL (which I hope to see in Melbourne). I was a little taken aback on some of the features regarding editions, but I think once I get into it more I'll see the great potential this feature has. Many thanks to those international speakers who came to our remote capital, it was good to catch up with old friends and meet new ones. For those making their first or second appearance as a presenter, good work - I hope they went well and we all trust you'll be up for doing it all again next year. To all heading to Melbourne next week, I'll see you there! One of my recent presentations was inspired by some colleagues talking about the difficulty they find searching the Oracle documentation to find the information they require. During this presentation I mention a book I read recently (alas I can't remember now which one) where they refer to the concept of the world's entire knowledge being stored on a device the size of a grain of sand. Seems a little fanciful now, but imagine what sounded fanciful back in 1901, and compare that to what we have today. Of course the reason I made this reference was that our search engines are going to need to become smarter. And we're going to need to be smarter in relation to how we pool information from all resources. For years now hardware has been sustaining growth to the approximation of Moore's Law. Hardware companies have certainly had their day in the sun, and that indeed continues. Oracle's recent partnership with Sun, releasing information on Exadata V2 show us what's happening in our little sphere. Microsoft's time in the sun is beginning to wane. Competition grows strong between Bing & Google, and a recent news item caught my attention. On Google's official blog they announced their future integration with Twitter. Now I mentioned how we need to be smarter with the way we integrate our information. I feel this is a good step towards this goal. Sites like Twitter are an untapped goldmine in regard to current information, current news stories, and the current opinions of the masses. One of my all time favourite books explores (among other things) the power of real-time information. Richard Wiseman, psychologist and skeptic, recently used Twitter as a tool to conduct a scientific experiment. I heard him speak on a podcast recently where he's straining his brain trying to work out how to use social networking sites such as this that lead the cultural meme as an effective tool to do powerful studies on mass & diverse populations. Integration of this information with powerful search engines I'm sure will aid his work. 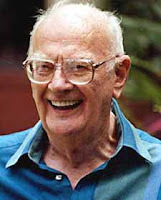 Arthur C. Clarke's book linked above mentions a generic "Search Engine" as being a tool ultimately hard-wired into our brains, such that we can use it to search for information, such as looking at the background of someone you just met while you strike a conversation. Considering the world's knowledge is now more than just an ancient library of information, I feel that "information finding" companies like Google will be the strong force over the next few decades. I also believe the tide is turning away from journalism and more towards blogs. I particularly find this on the scientific blogs I read. Recently it's been mentioned that perhaps we'll need to pay a subscription for obtaining news from major sources - just like buying a newspaper. I doubt such a model will work well, and for the type of new I'm interested in, I find science bloggers to a more accurate, objective and entertaining job. So perhaps future search engines also need to tailor to our preferences, our needs of the moment. We certainly see some of this happen now when we search for books on Amazon, or listen to music on iTunes or LastFM - common purchases are linked together and strengthen connections like the neural networks I learnt about in university. Search facilities are the next big thing. Now before I finish, considering this is an Oracle themed blog, I best mention one of Oracle's best search facilities is Oracle Text (formerly Oracle InterMedia). I'm waiting for the opportunity to explore this feature even more after developing a wonderful search facility a few years ago. Perhaps this requires a future presentation to highlight this possibly underutilised feature. My thoughts for this week conclude with a quote sourced from Twitter via my RSS feed. Thanks Jeff, for reminding me the 2009 AUSOUG Conference program has been released. Jeff has indeed listed some key presentations. Having a look through the programs it seems I'll be conflicted in selection between some of the topics. I'll be looking forward to seeing how my university friend Gabriel Ilarda goes with his first presentation, although he'll face tough competition with Tim Hall on the current schedule. I look forward to seeing everyone again this year, and if you have registered yet, the early bird rate has been extended - so get in while you can! I'll be there in Perth and Melbourne, so come by the Sage Computing Services booth and say g'day. When I talk to people learning about how to write queries in Oracle - particularly business analysts - a typical conversation would consist of basics such as single row functions, joins and aggregates. However when the subject of DDL is raised, such as CREATE TABLE, I often get the reaction - "Oh, I don't need to know that". I beg to differ. Regularly I create little tables to test theories with; confirm behaviour; and demonstrate test cases - in fact my schema is littered with them. I think this is an important skill, particularly the latter. If you're having trouble getting some task done, it is often helpful to simplify the problem to the lowest common denominator - a basic test case. Colleagues, DBAs, Oracle support - they'll all ask for the same thing. Visit asktom.oracle.com, he requests and uses them all the time. So I think one should fluent with creating and dropping small test tables. Take the example of demonstrating the handling of nulls by the AVG group function. -- ... and clean up your schema! If you specify the asterisk (*), then this function returns all rows, including duplicates and nulls. With this in mind, I can then relate back to my actual data and see how the following two queries can differ in behaviour just because of the expression I've used within the count function. We've always got to consider nulls, even with aggregated functions! In the context of a person learning how Oracle behaves, the simple process of creating small test tables can be quite valuable. The Oracle database provides the ability to obfuscate PL/SQL code using the wrap utility. This wasn't acceptable, so my solution was to declare variables that contained one character strings and concatenated these to form my seed. In hindsight, perhaps I also may have used CHR() to formulate a string. Recently on discussing this topic I wondered if the current version of the database had the same issue. I tried on 10gR2 using a combination of supplied PL/SQL packages. So it seems that the algorithm has improved and being able to "see" strings in the wrapped code is no longer a problem. Once again another demonstration of how "known knowns" can change over time, and you must always test behaviour on your version; your infrastructure. The call for papers has been re-iterated for this year's AUSOUG 20:20 Foresight National Conference Series. Always a good opportunity for networking, learning and a few fun & games, this year's conference series is ready for abstract submissions from young & old. If you've never written a presentation before, I highly recommend it. If you have, then get cracking on the next one! I've (hopefully) got two great topics up my sleeve this year and I look forward to the experience. Visit www.ausoug.org.au/2020 for all the latest information. Hope to see you in Perth and/or Melbourne! Steven's second session remained light on for technical details, which was great for a Friday morning. He dealt with a topic that can be applied to any language and one that every developer faces on a day to day basis - the balancing act between deadlines and writing maintainable code. As I write this I remember the old adage from Microsoft Secrets, and probably numerous software engineering books - every step a bug makes towards production, the exponentially more expensive it will be to fix. Steven mentioned a few basic mantras and elaborated on each. I think this was well received by the audience and it always makes a difference to hear the argument from authority. Construct and enforce coding standards - even to the extent of when to utilise SQL. Steven pointed us to a set of standards he follows and has put out for public comment. - Utilise your development tool's template facilities. Whether it be Toad, SQL Developer, Textpad... they have have facilities to generate say a package with all the stubs, exception handlers, comment headers etc you need to avoid the White Canvas of Death, as he calls a blank .sql file. This helps with the enforcement of coding standards. define a package for constants, and don't hardcode ANY value. If there is a slim chance in 100 years it could change, it should be defined somewhere. This also goes for formulas such as a full name evaluation from numerous fields. Functions in general should work like a funnel. This way you can avoid ORA-06503 - Function returned without a value. PL/SQL warnings can help with this. Steven's words with this comment obviously help describe what a funnel looking function looks like! "Two carpenters were asked to make the same cabinet. The first carpenter, and old man, spent the first 2 hours thinking - studying the plans, laying out his tools. The second carpenter, an apprentice, (put his cowboy hat on) and got cracking straight away - sawing wood, drilling holes, occasionally swearing and looking for his hammer. He looked over at the old man thinking (chuckling), crikey, I'm halfway through this cabinet already and he's still thinking about the job! The old man then starts making the cabinet. All the relevant bits of timber were within arms reach as he built the cabinet, every tool never more than a step away. Actual construction of his cabinet took 30 minutes. Meanwhile, four hours in, the apprentice is still putting 'finishing touches' on his cabinet (working out how to put the doors on straight). The old man beamed at his work. Every join flush, every screw lined up. When the apprentice finally finished his, he figured he'd do better next time. Practice makes perfect." As for coding practices, I had a flick through the book Steven was giving away on the day, and it looks well worth the read. Perhaps a book like that should be a standard text in a university curriculum? Now to my first major criticism for the day. 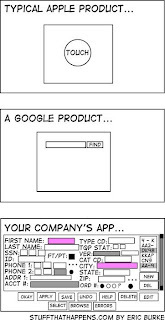 The concept of PL/SQL APIs to every table. I noticed Tim Hall also describes this sort of utopian development environment where all DML (including SELECT) for a table is done via PL/SQL APIs and any results returned via associative arrays. As I understand it, utopia is like the speed of light, or absolute zero - theoretically you can never reach it. And I think the reason in this particular case is the balance required between a tuned application and an abstracted/encapsulated one. To his credit, Steven himself said his focus is on PL/SQL performance and integrity, he's never been a SQL tuning fanatic. Steven also mentioned Tom Kyte's mantra of "if it can be done solely in SQL, then do it in SQL". If there is no need to introduce PL/SQL for a solution, then don't. E-Business Suite has been utilising table APIs for years, and quite successfully. It creates a well placed barrier and internalises all the business logic, turning say the insertion of a new HR employee into a procedure call whose black box touches a dozen tables to manage the setup. It also allows customisations to be neater and separate from the main install. Software development theory aside, Steven did demonstrate a very nifty facility in his Toad suite to automatically generate all the typical APIs that may be required for a set of tables. Very tidy indeed. There are many ideals in this session that need to be reiterated to every developer, and every newbie (I feel I should stipulate I think this is not a derogatory term, we should all remember we were all there once) should also cover it thoroughly. 4/5 for this session. Points lost because I think Hungarian notation should be in the major standard ;-), and further elaboration should be made on the utopian ideal of PL/SQL APIs - although time is always pressing for such a theological debate. Recently while doing a little web surfing & blog investigating, I signed up to Oracle Mix and Oracle Community (my profile and profile). It's sometimes difficult to get familiar with a new forum/website, and at the moment it seems a little overwhelming. However the idea for the two sites suggest good potential - I was wondering if anyone out there could provide thoughts on their experiences? Have you used it as an effective tool? What positives/negatives have you found? Are you happy to stick with an RSS blog feed?